I do not often head out to the outskirts of Victoria to dine, but when I am hanging out with PARAVI, Victoria’s homegrown paranormal research and investigation society, we visited Six Mile Pub to check out its supernatural history. Or for me, to check out one of their many flavourful burgers. The first time I was here, I ordered their Guinness Cheese and Bacon Burger ($16.50) as a take out meal. I did not want to pass up the chance in case I did not return. The singular large crisp onion ring really made this particular meal stand out, and I quite liked the toasty warm bun. I thought the meat was very tender. It tasted was like it was braised; the juicy softness complemented the added crunch very well. And the tanginess of this particular dry stout tasted light on the cheese. The best part of this meal was that the fries held their flavour. By the time I was home, I could not stop eating them and when they were gone, I finally touched the burger. 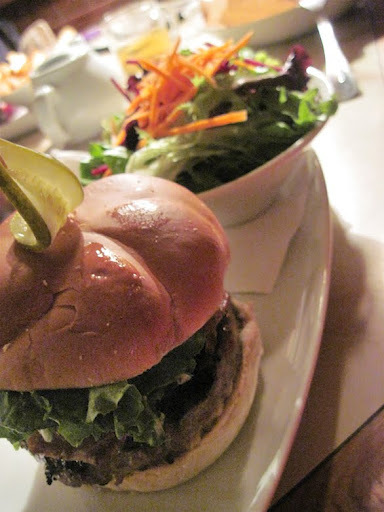 On this most recent occasion, I opted for their “house-smoked” Back Bacon and Blue Cheese Burger ($15). I seem to have this affinity for opting for expensive burger joints, and while the price is on the high side, the presentation and addition of the dill pickle on top than inside the burger is well worth it. The cool creamy cheese was added last to complement the warmer burger. I was taking small bites just so I could savour the interesting temperature differences that played in my mouth. Also, there was a light sweetness to this burger that came from the apple chutney. If I had to choose between a clear winner of the two burgers, I’d say the Blue Cheese burger ranks as number one. That might get unseated, however, by the Six Mile High Burger ($18). The menu describes this thick morsel as containing two patties and a portobello mushroom. I will certainly have to come back for more. The consistency of Six Mile’s thoughtfulness in taking care of their customers when they are close to closing time is certainly worth noting. As for the other kind of spirits that Team PARAVI hoped to find, there certainly was the feeling of curiosity from both sides of the veil about what we were doing there. This entry was posted in Food, Reviews and tagged Alcohol, Burgers, Dinner, French Fries, Lunch, Pub Food, View Royal. Bookmark the permalink.